There are certain rooms where the functionality is of primary importance. Bathroom is definitely one of them. The main challenge with most modern bathrooms is the limited space people are forced to work with. This is tough mostly because of the things we store in a typical bathroom, and, consequently, the number of storage units we should have. So, it is crucial to look for solutions that would combine compact size and great storage capacity. Here are some of those – hopefully, they will be enough to help you get started. If you are lucky enough to have at least some kind of a niche in your bathroom – do not think twice and turn it into a wall fitted cabinet. The task is quite simple – you just have to hang in some shelves and adjust a door. Or, you can forget about the door and keep your custom-made shelves open. If the niche is not something you can boast in your bathroom, consider buying a ready-made, freestanding cabinet . There are cabinets that can stand on the floor, and the ones that can hang on the wall – the choice is yours. And, no one says that you cannot have both – especially if your space is enough. Basket frames can be quite useful for keeping your dirty laundry, or simply some bottles and fluids that you do not need everyday. 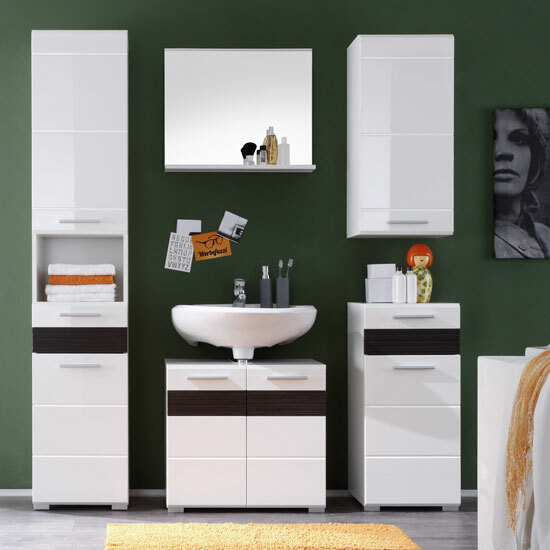 They look very stylish and compact and can serve as great storage units for limited space bathrooms. A bathroom display stand will look more elegant in comparison to a basket frame. Yet, most standard models normally feature the same dimensions. Display stands can be used for storing cosmetics or towels, cleaning fluids or any other functional items you want to keep at sight. Occasional tables have the same functionality as display stands; yet, they are usually more compact and have fewer shelves – two or three tops. Yet, the best approach to any room decoration is purchasing complete furniture set. There are dozens of amazing bathroom collections that come in different assemblies, feature various functional units, and are designed for a wide range of dimensions. Plus, purchasing all of the functional items at once is not only faster, but – quite often – also cheaper. Another important thing you have to bear in mind is that bathroom furniture can be quite pricy. Quite often, it is one of the most budget-demanding rooms to furnish. So, you might want to check out bathroom furniture sales – a lot of big stores introduce them on the regular basis. Sure, the selection on sales may be rather limited, but on the whole there is a chance to find plenty of high quality items that are sold at a reduced price. Usually, the most lucrative sales are introduced before big holidays or the arrival of a new furniture collection. Yet, even on an ordinary day it is possible to find some generous discounts in big retail chains.